“Nufar Fibers” is rich in complex carbohydrates and natural dietary fibers which provide the feeling of being satiated over many hours which helps in the process of dieting. “Nufar Fibers” contains: Whole quinoa, psyllium, oat bran, flax seeds, flax bran and holy thistle (silybum). Instructions for use: Take with meals, once or twice daily. Recommended dose per use: Add 2 heaped tea spoons of “Nufar Fibers” to your meal while (you must!) drinking one full cup of water. It is recommended that “Nufar Fibers” are added to ordinary food and beverages such as: Yoghurt, salads, tea, coffee, mashed potatoes, rice, soups, and all types of baked goods such as bread and cookies. Dietary fibers absorb water and expand in our stomach creating a long lasting sensation of “feeling full”. Our bodies require about 20-25g of dietary fibers daily, whereas we only obtain about 12g a day from our ordinary western diets. As a result of this deficit, we feel hungry throughout the day. Adding about 2 spoonfuls of “Nufar Fibers” to our daily menu supplements the quantity of fibers lacking in our diets and as a result of this we do not feel constant pangs of hunger. Dietary fibers are not digested by our bodies and therefore they have no calorific effect. Dietary fibers absorb toxins, fats and cholesterol. They assist in cleansing our digestive system and ridding us of waste products. Dietary fibers absorb and bind fats and cholesterol and thus maintain low levels of fat in our blood that assists in preventing arterial sclerosis. “Nufar Fibers” are rich in complex carbohydrates that are digested and broken down in the stomach in a slow and prolonged process that creates a long-term feeling of fullness. 1. The complex carbohydrates are slowly turned into energy and not stored as fat. 2. During a slow digestion process, the quantity of glucose secreted into the blood is smaller and therefore the pancreas puts less insulin into the blood. As a result of this, a quick drop in blood sugar levels is prevented that checks a new sensation of hunger and the associated and unnecessary eating (as happens when we consume simple carbohydrates). Thus, in practice, dietary fibers and complex carbohydrates assist the dieting process and help to balance our blood sugar levels. 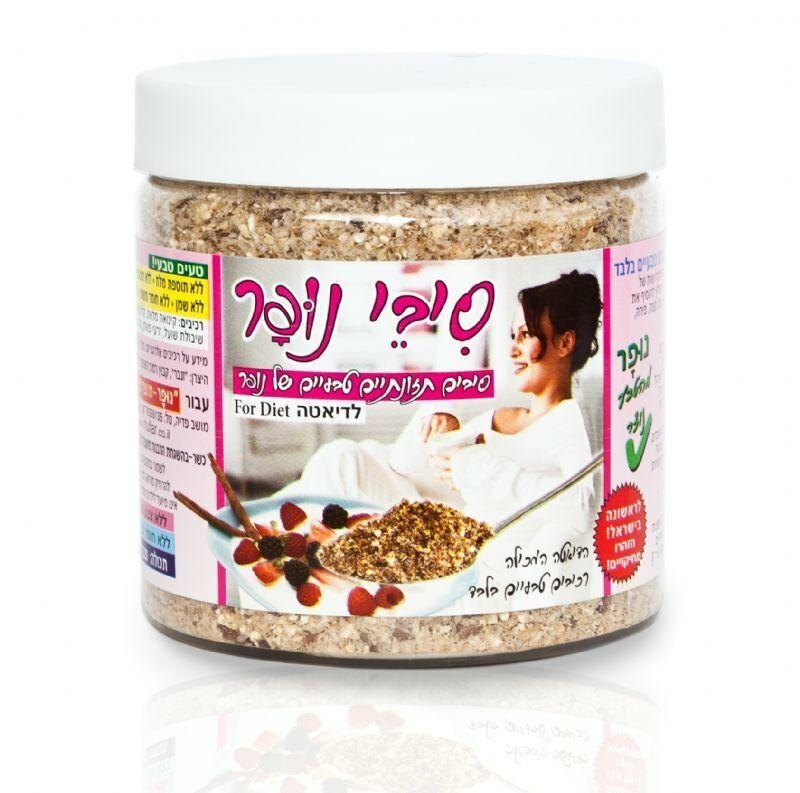 The whole grains and bran in “Nufar Fibers” are rich in the following minerals and vitamins: Potassium, magnesium, iron and zinc, as well as Vitamins A, B, E and K.
Flax seeds - “Nufar Fibers” contains flax seeds which are a vegetable source of Omega-3. Holy Thistle (silybum) - “Nufar Fibers” contains silybum that assists in the correct operation of the liver and cleansing it. This activity assists in reducing the level of cholesterol and fat in the blood. In addition to this, the liver purifies the body of toxins. A correctly functioning liver assists in preventing that unexpected fatigue we sometimes feel. Whole quinoa is rich in whole protein and contains all of the amino acids our bodies require. Vitamins and Minerals: "Nufar Fibers" contains calcium, potassium, magnesium, manganese, iron and zinc, as well as Vitamins B & E.
No added salt, no added sugar, no oil, no preservatives, no food coloring. Naturally tasty - without added flavorings or aromas.